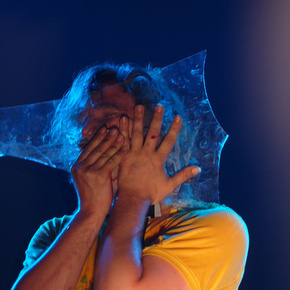 What’s been described as “a trumpet player trapped in a two dimensional universe” is in fact the unique work of Justice Yeldham, a maverick musician with an unhealthy obsession with sheets of broken glass. In his infamous show that has astonished and bemused countless people in over 40 countries, yeldham ecstatically purses his lips against sheets of amplified glass whilst deftly employing various vocal techniques ranging from throat singing to raspberries, turning discarded shards into crude musical instruments. The results are a wild array of cacophonous noise that is strangely controlled and oddly musical. The instruments simple, original and effective premise is a welcome riposte to over complicated musical performances of modern times. A one of a kind act re-defining the expression ‘don’t try this at home’ this show quite simply needs to be witnessed to be fully appreciated, let alone understood.